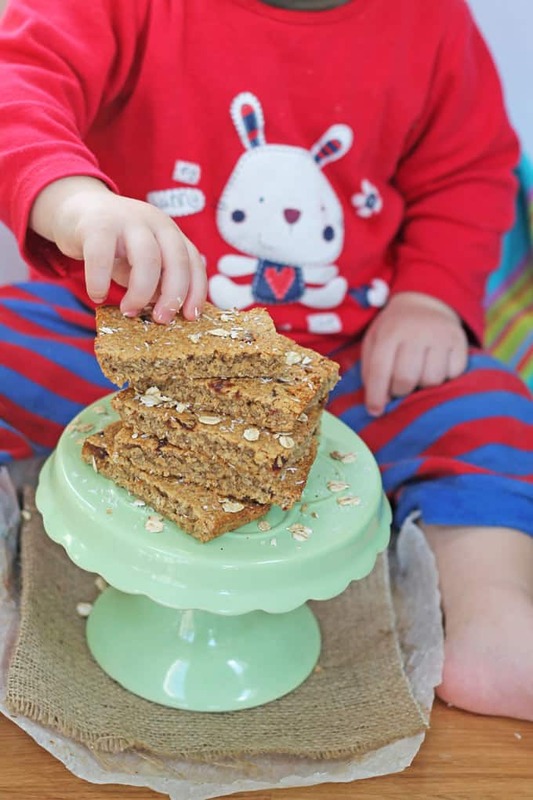 Quick and easy sugar free flapjacks or oat bars, perfect for baby led weaning! 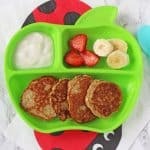 For months I’ve been wanting to post more baby friendly and weaning recipes and I am so pleased that I have FINALLY got round to my first one! My little man is now 13 months old, so a little past the weaning stage. But with only 5 teeth there are still lots of things that he struggles to eat. I also try to keep his diet as low in sugar and salt as possible and so I still find myself making lots of food specifically for him. 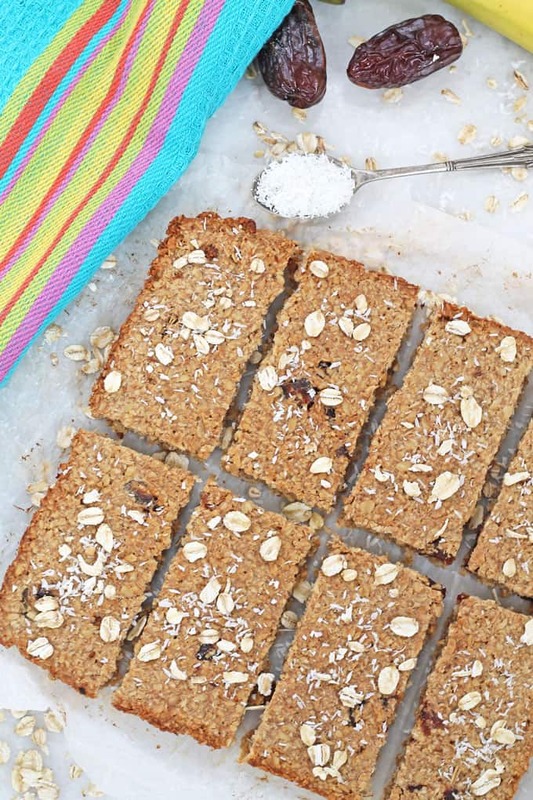 So my first recipe just for babies is going to be these Sugar Free Flapjacks (or Oat Bars). My little man wasn’t much of an eater until a couple of months ago. It used to be a mission to get him to eat more than a couple of morsels of food at a time but recently he has turned into an eating machine. Some days he eats so much that I struggle to come up with varied and interesting snacks for him. Those boxes of soft oat bars are handy in these kind of situations but they can work out expensive for what essentially is a few handfuls of oats so I decided to make my own. 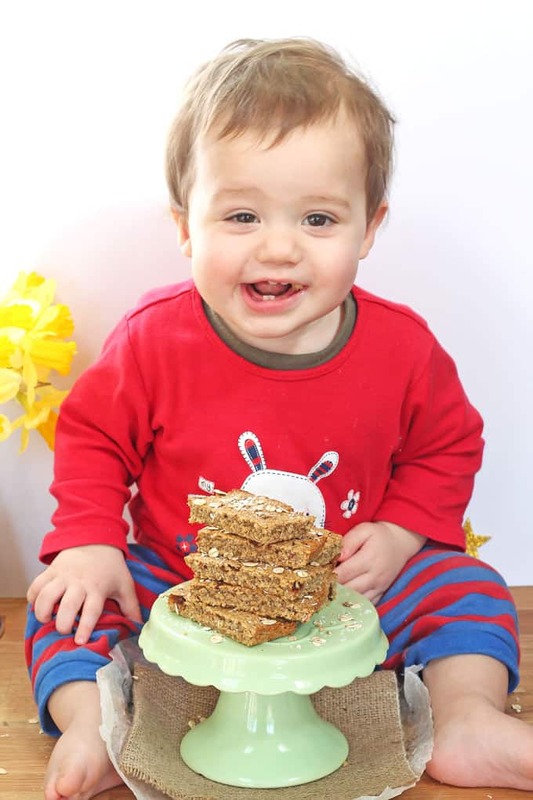 My flapjacks are sugar free and also contain no honey, meaning that they are suitable for babies under 1 year. 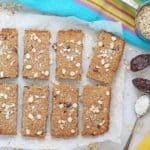 They are naturally sweetened with bananas, desiccated coconut and dates and are soft enough for little mouths to manage. I blitzed the oats in a food processor first just to break them down a little and make them easier to eat. 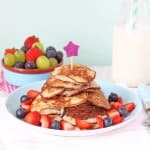 If you are making these flapjacks for older children or babies with lots of teeth then you can skip this step. 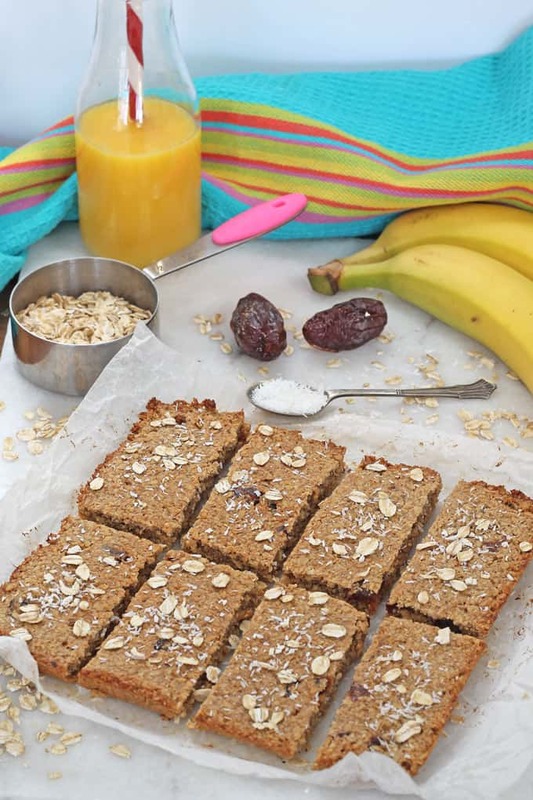 This recipe also makes a great base for so many different flavoured flapjacks. You could add some nut butter for babies over 1 year, dried fruit or even some dark chocolate chips for older children. The flapjacks are best eaten within 24 hours or they will start to dry out. However the best thing to do is to freeze them. Wrap each one in individual parchment parchment paper and pop in a freezer bag or a box. They will defrost in 30 minutes or less so are perfecting for throwing into your changing bag ready to have on hand for snack time. 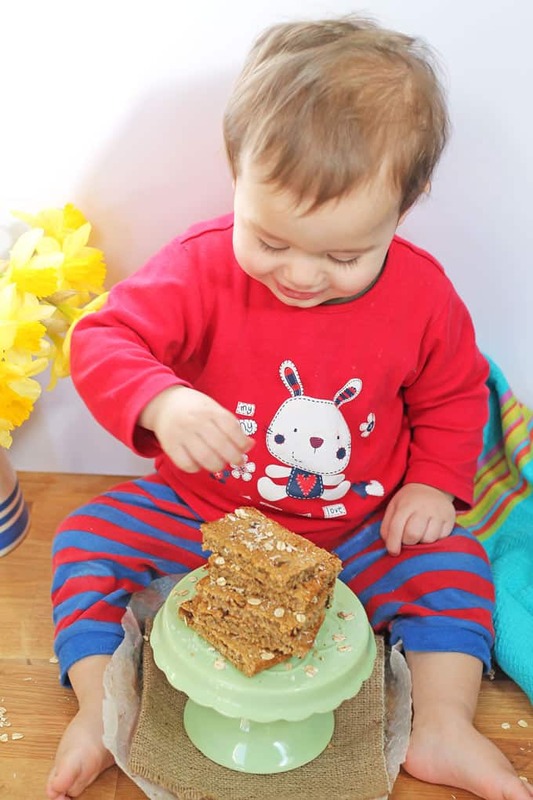 I’m really excited to be posting more baby and weaning recipes. 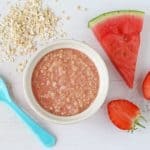 Are they any baby friendly recipes in particular that you would like to see? Just drop me a message in the comments below! Preheat the oven to 170c / 340f and line a baking dish (mine was 8in x 8in) with some parchment. Blitz the oats in a food processor for a few seconds to break them down a bit. Transfer the oats into a large bowl and mix in the desiccated coconut. In a blender blitz the melted coconut oil or butter, bananas, dates and fruit juice until it forms a sticky paste. Pour this on top of the oat mixture and stir until everything is well combined. Scoop the mixture into the dish and press down with the back of the spoon to make it compact. Bake in the oven for 20 – 25 minutes or until the edges of the mixture are beginning to brown. 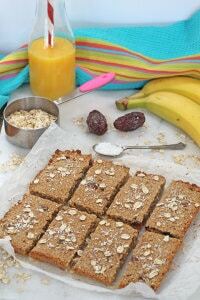 These flapjacks can be stored in an airtight container for up to 2 days. However they are best eaten within 24 hours before they start to dry out. They can also be frozen. Simply wrap them individually in parchment or in individual freezer boxes. They will defrost at room temperature in about 30 minutes. Hello! Do you think if I don’t have any oats in hand I could substitute the oats in your recipes with oatmeal cereal such as the Happy Baby one? Thanks! Hello! Do you think if I don’t have any oats in hand I could substitute the oats in your recipes with oatmeal cereal such as the Happy Baby one instead? Thanks! They were excellent. thanks! I only had 1/2 banana so I cooked 1 apple in a bit of water instead, then added it to the blender with the dates and banana, and I kept the cooking water because I don’t buy juice. I also added 2 huge spoons of peanut butter! I’ve been making these for we’ll over a year now and I love how adaptable the recipe is. I’ve substituted just about everything, raisins and apricots work well instead if dates, and I’ve added everything from nuts (ground,butters and chopped) every dried fruit possible, normal chopped fruit too,and seeds, also a pinch of cinnamon and nutmeg. The only thing I never bother with is the fruit juice!Everyone loves them and they’re a firm favourite if my twins! Thank you! Thanks so much Sarah. Love all your variations too! Ooh thanks! I was wondering if I could omit the juice. Would oat flour work just as well as rolled oats? My daughter is under1 yrs old and I thought to save time on blending the oats I could use oat flour. Should the oats be that refined or not? Yes that should work just as well! Super recipe! Actually made these for my husband who is on a bit of a health kick and couldn’t find anything in the shops that was sugar free. Will save a fortune as well on his usual shop bought ones! Thanks so much for this fantastic recipe! I tried it this morning and the result is absolutely delicious. Both my 18 month old and I can’t get enough of them. 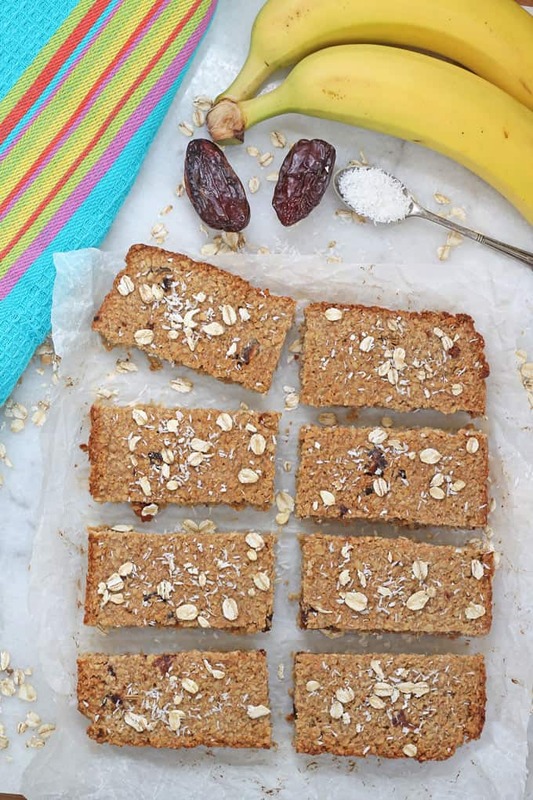 I’d call them oat bars instead of flapjacks, at least mine turned out more like oat bars. Do you think it would be possible to replace the butter partly or entirely with vegetable oil and if so how much? Absolutely fantastic Ciara, thanks for sharing this and all your recipes. I have just become a ‘My fussy eater’ convert. Cant wait to try them all. Yes that would probably work. Or fresh juice too. Hi there. I have bananas that I had frozen for muffins. Would these work or would they have to be fresh? Hi Claire, you can certainly try it. The dates make the mixture a little sticky so that the bars hold together but you might get the same result from the apricots if you blend them up really well. Let me know how it goes! It seems delicious and healthy. Hope your little one like them! Thank you for this comment, I was about to post the same thing. Sugar from fruit is different to refined sugar. Fructose uses the liver to break down rather than stomach so no spike in insulin…. better form of sugar…and children use it up! I think she’s well aware of that. Maybe she should of stated that they’re unrefined for the food police but if you thought you’d find a flapjack minus a “sweet” binder you were maybe looking for cardboard. I for one can’t wait to try this for my little one. Thank you. These were on point! A real hit. I also used honey instead of Juice for my 15mo. She loved it. Fantastic, so happy to hear that! Hi ciara, I am thinking of making them in a muffin tray for my 7,5mo boy .. Do you think they’d bake well in muffin form? Thank you! Can’t wait to try them. I’m not 100% sure they’ll work as I haven’t tried this myself, but its certainly worth a shot. Maybe use cupcake liners just in case they don’t stick together very well. Thanks so much for coming back and letting me know. So glad you enjoyed them! My son is 2 years old.Is honey OK for him as a sweetener instead of dates? Thank you. Hi, yes honey is ok for a 2 year old! Hi there. Just to say a big thank you for your excellent sugar-free flapjack recipe. It’s gone down very well with my seven-month old boy with whom I’m now doing baby-led weaning after over a month of battling it out with purées. He ate a whole finger of flapjack this morning – and seemed to really enjoy the whole process – which I was staggered by! Think they are rather tasty myself and they’ll be a hit with my mother, who’s on an added-sugar-free diet. Much appreciated! What sweet we can I use in place of the dates and how much , maybe maple syrup ? Hi, honey would probably work the best as it will help the mixture to stick together. Try 1 tablespoon to start with and add a little more if it doesn’t seem to stick! Love your recipes, keen to try this one but I don’t have space for a food processor, tried another date recipe using the nutribullet but it didn’t work – any tips? Hi Lucy! Maybe try soaking the dates in warm water before you blitz them in the nutribullet. That might help to soften them enough so that they break down. Failing that you could also buy date syrup and just use that instead. Hope that helps! That’s brilliant thank you I’ll try that, so many recipes use them! Hey there I blitzed everything in my smoothie blender and it worked fine! I did substitute honey for the juice. Was great! I am trying to find some more plant-based recipes (also for brekky) cos I wanne get the whole family on more veggies. My hubby, baby (7months) and me ( trying to get off my pregnancy weight). Would be very grateful for some ideas! Thank Ines. I want to eat more plant-based meals too. Its so healthy and also good to give your body a little rest from lots of meat and dairy. I will try to upload more! What is 1 tbsp desiccated coconut? These look great – I wonder if Roo would like them. They’re definitey worth trying Laura. So handy to have on hand for baby and toddler snacks! These should be renames sugar free flapjacks for Bintu ‘off chocolate’ weaning.